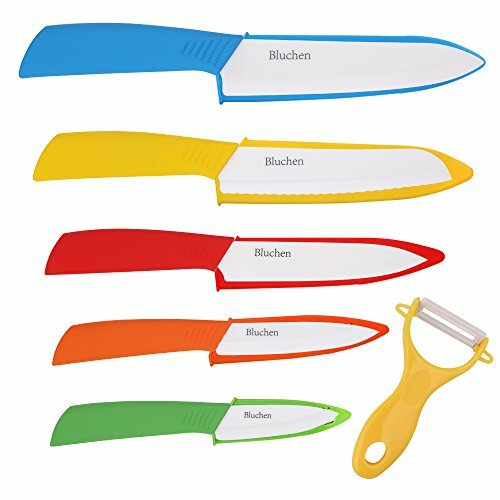 Don't Miss This Chance To Make Your Cooking Life Easier With This Fantastic Colorful Ceramic Knife Set Brought To You By Bluchen! If you are looking for a premium set of high-quality colored knives that are 60 times harder than conventional knives, an also safe for your hands and odorless, then you have found exactly what you were looking for! These knives are easy to use, they have an advanced, ergonomically designed anti-slip grip, and super sharp, non-corrosive, zirconium oxide blade! They are excellent for preparing meat, seafood, veggies, salads, and anything else you can imagine! What's more, they are also ideally suitable for small restaurants and pubs, since they are color-coded and also feature a supreme sheath cover for maximum finger protection! For your maximum protection, we firmly suggest that you keep this knife set away from children. Do not put it in the dishwasher, test the blade's hardness with your hand, or cut hard food or meat portions that have bones. Mince, Chop, Slice, Dice, Cut, Peel! The set includes six different kitchen utensils, five knives for different uses, and a peeler! The 3" Paring knife is ideal for soft fruits and veggies like zucchini, cucumbers, eggplants, tomatoes, and strawberries, while the 4" Fruit one is perfect for oranges and apples. The 5" Utility knife is an excellent choice for slicing vegetables and meal preparation, and the 6" chef's knife is the one you're gonna use for cutting and mincing garlic, or for making small tomato or potato cubes - and it's no secret what our 6" bread knife can be used for! Last, but not least, the peeler is the fastest way to peel your carrots, winter squashes, or courgettes! So, Still Waiting And Thinking? Hurry Up & Get This Incredible Ceramic Knife Set - And Your Bonus Peeler Too! A MUST-HAVE SET FOR ANY KITCHEN COUNTER! You can forget about your usual knives that constantly need sharpening and start to wear after a few weeks of use! With this exquisite set of ceramic, wear-resistant, anti-rust, multicolor knives your food preparation will become a piece of cake; you will certainly love using them! A BLADE THAT NEITHER RUSTS NOR SMELLS! There's a reason why Zirconium Oxide blades are a worldwide favorite choice; not only they are non-corrosive and antibacterial, but they are also non-toxic, eco-friendly and don't allow food odors to be transferred. Oh, and let's not forget to mention that they are 60x harder than conventional blades as well! KEEP YOUR FINGERS 100% SAFE! Unlike many similar products, our knives feature rounded corners and a sheath; a double-layered protection for your fingers, but we didn't stop there! We have also added an anti-slip, sturdy handle, which allows for maximum steadiness while you use each knife; thus lowering, even more, the chance of an injury! ALL THE KNIVES YOU NEED, PLUS A HANDY PEELER! Our set includes almost every knife a kitchen needs; a 3" paring, a 4" utility, a 5" slicing, a 6" chef, and a 6" bread knife! However, we have also thrown in a great veggie and fruit peeler, so that you can prepare your meals with even more ease! WE DON'T PLAY WITH YOUR HAPPINESS! Instead of merely making statements that sound nice, we proceed to actions; our knives are backed with a 30-day money-back, noquestions-asked guarantee, AND with a one-year warranty, for your peace of mind! If you have any questions about this product by Bluchen, contact us by completing and submitting the form below. If you are looking for a specif part number, please include it with your message.